Long before the first student ever set foot on campus, the land now home to UCSC was the hub of a booming limekiln business that filled ships bound for San Francisco and beyond. Before that, Native Americans known as Costanoans settled the area. 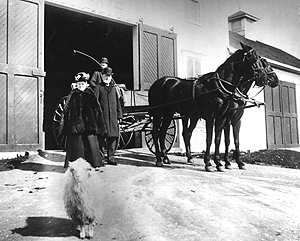 Mr. and Mrs. Henry Cowell are shown in front of the Carriage House at their ranch, which became UCSC. The Carriage House in the background is now home to the University Relations Division and is one of several original buildings that continue to be used. Capturing and preserving this colorful history is the goal of a $100,000 campus heritage grant for 2004 awarded by the Getty to UCSC. The grant will allow the campus to inventory its historic resources and nominate the area around the main campus entrance to the State and National Registers of Historic Places. Known as the Cowell Ranch historic district, the section includes the old ranch house, cook house, carriage house, granary, and what remains of the cooperage and limekilns. 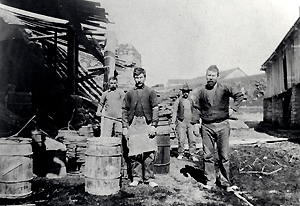 By the late 1800s, the Davis and Cowell Lime Company was the largest operation of its kind on the West Coast. Drivers using the main entrance to campus pass by remnants of the limekiln. The grant is one of 25 Campus Heritage awards nationwide, and caps a longtime campus effort to gain historical recognition. Gettys Campus Heritage Initiative, begun in 2002, has awarded more than $7 million to more than 50 colleges and universities in a nationwide effort to preserve historic buildings, sites, and landscapes. The Getty is one of the largest philanthropic supporters of visual arts in the country and a leader in conservation and research in its field. Barnes will direct the historical recognition effort, but faculty members and studentsas interns and through independent-study classesare also expected to play a major role in the research. Barnes plans to work with history of art and visual culture professor Virginia Jansen, who teaches courses on the history of UCSC campus planning and the history of American campus planning, as well as Assistant Professor Sheila Crane of history of art and visual culture, who specializes in modern architectural history. The University of California at Santa Cruz is renowned for its beautiful campus," said Deborah Marrow, director of the Getty Grant Program. "The Getty is delighted to support the university's outstanding effort to study and preserve its important historic sites as it plans for the future development of the campus."  Compilation of a campuswide inventory of cultural resources, including Native American sites. The California State Office of Historic Preservation will serve as the reviewing agency for the Cowell Ranch Historic District Evaluation, the Cowell Ranch Historic District National Register Nomination, and the UCSC Cultural Resources Inventory report. Barnes estimated the work would take nine months to a year to complete. It was in the mid-1800s that lime production was a thriving industry in Santa Cruz County, and limestone-processing kilnsclearing the nearby forest for fuelwere constructed on what is now the campus. By the late 1800s, the Davis and Cowell Lime Company encompassed 12,000 acres and was the largest operation of its kind on the West Coast, making Henry Cowell the richest man in the county. Cowell died in 1903, and a few years later the kiln was closed as demand for limeused in building materialsdecreased. The property was leased for grazing, and a gentlemans ranch on the property continued into the 1950s. Negotiations began in 1961 with the S. H. Cowell Foundation to purchase more than 2,000 acres of the property--a small portion of the original ranch holdings--for a new University of California campus; classes began in 1965. Today, several buildings from the ranchs limekiln heyday have found new life in academia. The old ranch houseits formal entry gate on High Street restored in 2002is now the Womens Center. The Granary is a child care center, the Cook House is home to the Admissions Office, and the University Relations Division has replaced the horses in the Carriage House. While some of these sites are in good repair, others are deteriorating. Researching the areas history will also be helpful as work proceeds on the 2005-2020 Long Range Development Plan for the campus, Barnes said, noting that the campus is required by state law to consider the impact on cultural resources before building. There are important remnants of historical and prehistorical activity in many areas of the campus, he said. The J. Paul Getty Trust is an international cultural and philanthropic institution devoted to the visual arts that features the J. Paul Getty Museum, the Getty Research Institute, the Getty Conservation Institute, and the Getty Grant Program. The J. Paul Getty Trust and Getty programs are based at the Getty Center in Los Angeles. The Getty Grant Program provides crucial support to institutions and individuals throughout the world in fields that are aligned most closely with the Getty's strategic priorities. It therefore funds a diverse range of projects that promote learning and scholarship about the history of the visual arts and the conservation of cultural heritage, and it consistently searches for collaborative efforts that set high standards and make significant contributions.